This is a neat trick I use when developing. This adds the username and password into the http request, so the user is not prompted. This has the added benefit that you can jump user easily in Windchill if you store the url as a bookmark. This is really useful for demos! 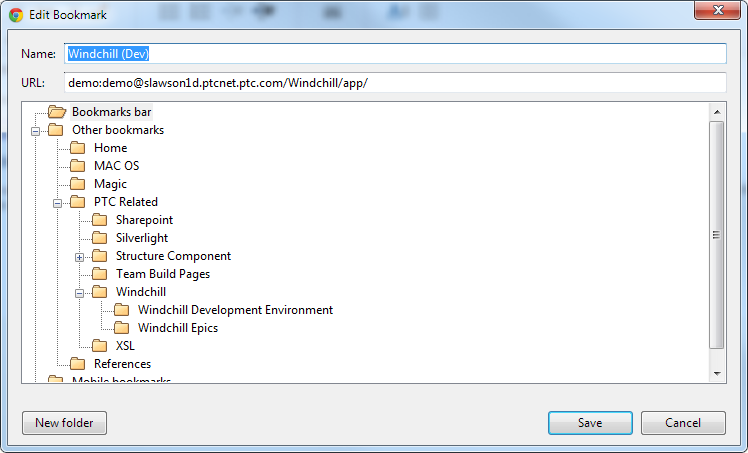 it says windows cant find "http://demo.demo@pc158218.ptc.com/Windchill/app/"
am i doing something wrong in the url ? stephen has mentioned like windchill-server- what is it? I think you need to change the address after the @ symbol to the address of your server. ya i got it now. i was trying this in Internet expolrer. but it does not work in IE. It works in mozilla firefox. Nice trick. But why dont you use New Session to login in to different user in IE? or Multiple profiles in Chrome? I also found this works in Chrome but not in IE. Works nice, thanks. In the old PTC/User forum there was another idea, to create a button logout. In this way, when you click on this button, the system it prompts again for username and password. Nice trick but just so readers know this is unsecure as it saves your credentials in text where anyone with access to your system could find it.